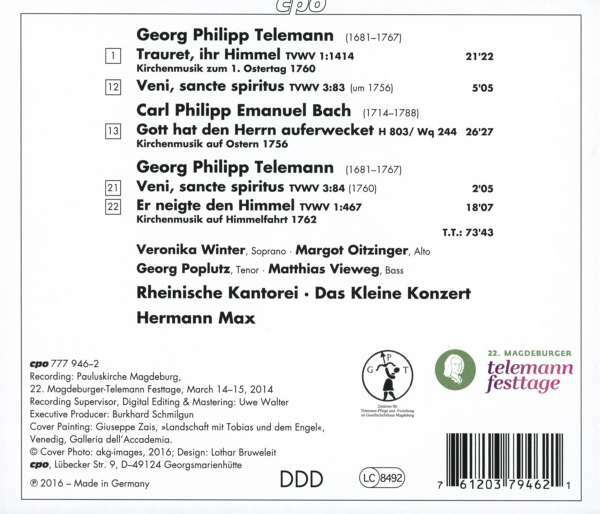 Der Artikel Georg Philipp Telemann (1681-1767): Kantaten (Späte Festkantaten) wurde in den Warenkorb gelegt. The Twenty-Second Magdeburg Telemann Festival Days in March 2014 celebrated the three hundredth anniversary of the birth of Carl Philipp Emanuel Bach, Telemann's godson and successor, with a program entitled »Generations: Carl Philipp Emanuel Bach and Georg Philipp Telemann.« The festival program offered concertgoers the opportunity to experience the similarities and differences in the music of these protagonists representing two compositional generations and traced lines of development in musical style. 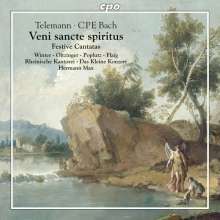 The live concert recording presented here features sacred compositions by Telemann and Bach written about the same time for Hamburg, some of which were first performed in modern times at the Magdeburg Telemann Festival Days. The Hamburg music director Telemann maintained intensive contact with composers of the younger generation into the late years of his life, exchanged ideas with them, and was interested in developments in the new musical style being formed by them. For their part, younger composers looked up – not without great veneration – to the »father of music« (Johann Heinrich Rolle, 1767) and intensively studied or performed his compositions, which left their mark on German music life over many decades. Among Telemann's contacts, those with his godson and later successor Carl Philipp Emanuel Bach are especially significant. A great part of the church compositions brought together here, all of them connected with the liturgical performance of music at Hamburg's five principal churches, number among the documents attesting to their relationship. Hörprobe Track 1: Chor: Trauret, ihr Himmel! und weine, du Erde! Chor: Trauret, ihr Himmel! und weine, du Erde! Hörprobe Track 4: Arie: Heil! Heil! dem menschlichen Geschlechte! Arie: Heil! Heil! dem menschlichen Geschlechte! Hörprobe Track 5: Choral: O Tod, wo ist dein Stachel nun? Choral: O Tod, wo ist dein Stachel nun? Hörprobe Track 7: Arie: Sei ganz Triumph, erlöstes Volk des Herrn! Arie: Sei ganz Triumph, erlöstes Volk des Herrn! Hörprobe Track 9: Rezitativ: Ja, unser Teil ist einst das Leben! Rezitativ: Ja, unser Teil ist einst das Leben! Hörprobe Track 16: Arie: Dir sing ich froh, erstandner Fürst des Lebens! Arie: Dir sing ich froh, erstandner Fürst des Lebens!